Thought about having Selkie speak to the image of her mother in tensei, but it would look weird to have her dialogue translated while the image's isn't. Plus it makes more sense to me that she would be excited and default to the language she's been primarily using for the past three years instead of switching gears on-the-fly. If she’s used to sarnothi technology and resonance, them why didn’t she realize that was at least a hologram. She’s seen her mom do some things, but she doesn’t have exposure to the whole breadth of sarnothi tech. That, and she’s what? 9 now? Exactly. If I recall the numbers right, she was five when she was left at the orphanage. She is NOT used to or understands how Sarnothi tech works… but she has seen something like this (this very specifically) before. Yeah, haven’t we already seen tochte back when she was saying goodbye to the other kids? Yeah, Tochte is goodbye, and she added ‘kunet to the end for “my friends”… I’m betting it’s something like ‘goodbye my daughter/child/some form of endearment’, and we know the end is I love you. But why did the record start to play not when the bow was taken off, but when Selkie was a certain distance *away*, even out of sight and hearing, from it? And why didn’t it wait with playing the message to Selkie / Nei Li, until she was near the bow again? In the first case, probably because Plo Quar wanted to make sure it wouldn’t go off if she took it off to sleep every night or the like. If it starts going off while she’s out of range, then presumably anyone who would take it off her would then hopefully bring it BACK to her, given what arrangements were made. Nice that she thinks of Crook as “my cat”. Poor Selkie, that’s gotta be quite a blow to her suddenly realizing that her mother isn’t actually there. Yeah, where is Crook? He must be terrified. Also poor Selkie. I have the horrible feeling that she’s been so excited that she hasn’t been listening to what her mom is saying, and that it’s going to be important later. Is it that the bow was a certain DISTANCE away from her? Or that it had been off a certain amount of time? I asked myself this too. 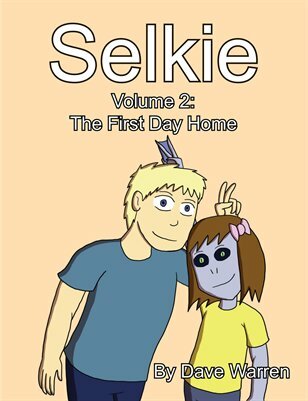 Looked it up – it’s distance: https://selkiecomic.com/comic/selkie538/ last panel. Hmm… Sarnothi are a parallel evolved race, who’ve developed separately from us in quite a different environment. There is no reason their tech should have ANY resemblance to human tech aside from obeying the most basic laws of physics… until they find a way to bend some of those (WE certainly have, or can fake it well enough that it looks like we have). I think it’s more of a you’re growing up and moving on detection. During the time at the orphanage, where there’s little to do, the last gift from Mom would be the most important thing in the world. If/when she gets adopted, it’s more likely that life would get busier and it would be forgotten. I gave some feedback 9 months or so ago about how the comic was good and had a lot of potential, but that I thought the author (Dave) wasn’t really good at handling new information/developments. It was almost like new things were just thrown in our face and while those things were creative and awesome, a little bit of suspense or introduction to them of some sort would have been good. A translation in the transcript would really be nice! “Elsword”/”Ara” (no path info displayed) may also push your limits some depending on how much cartoony/high fantasy gets a pass. The “online ladies,” “Asian pretty Ladies” (chnlove.com) and “Fall in Love with Asian Ripe Beauties” (chnlove again?) and “imvu” ads (also Google services) aren’t indecent, just suggestive enough to be rather jarring alongside your comic, as is the “Sumo” ad (for beanbag furniture). The “Dating Hot Single Asian Women” (chinesewomendate.com, also from Google Services) on the other hand, is showing more than I want to see at all. You probably want to block/blacklist that one, at least. I’m still behind after being cut off from Selkie for too long, but I thought near the current one would be more appropriate. Great comic, as always, and I apparently have many happy minutes of reading ahead of me before I catch up again. Google ads and other ad-since methods often base ads not on the site’s preferences but instead of the cookie and browsing history of the local computer viewing the site. If someone has a bunch of Asian NSFW ads… Well… Someone Googled it on that computer. A lot. Recently. Google ads and other ad-since systems base ads not primarily on the site they are posted on but often the cookie and browser history of the computer locally. As such someone seeing a lot of Asian NSFW ads google searched such terms. A lot. Recently. There is also the chance that you have adware, which can be a virus often spread on shadier sites. Ah, sorry my phone said it didn’t go threw the first time.